Daughter hilariously documents her dad's emotional journey through the Super Bowl. It's no secret that some people get a little bit over emotional when they're watching their favorite sports team, and that is especially true when your favorite team happens to be playing in the Super Bowl. 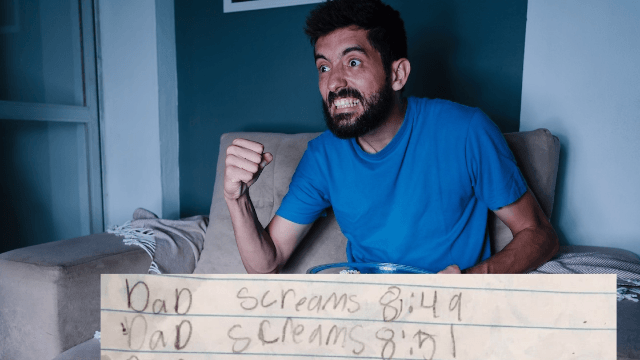 One little girl decided to take notes on her dad's reactions throughout the big game. (Based on her notes, her dad is definitely a Patriots fan.) Her log of his feelings is pretty hilarious. Reddit user BraveReddit posted an image of a notebook with the caption "She took notes of her dad's reactions throughout the Super Bowl." She took notes of her dad's reaction throughout the Super Bowl.